Foot Locker is increasing its focus on children’s and women’s apparel by investing in companies that specialize in these lines. Foot Locker is a growth company with more growth expected heading into 2020. The stock is reasonably priced and pays a 2.5% dividend. Foot Locker is a strong retail company giving value-focused investors a solid long-term investment at a reasonable price. Foot Locker, Inc. (NYSE:FL) has a solid history of revenue and earnings growth and more growth is forecast. The company operates profitably with strong returns on equity and decent profit margins. Over the last decade, the company's profit margins have averaged around 5%, and its return on equity averaged around 15%. The company is in a strong financial position operating with low debt levels and ample working capital. Foot Locker's total debt is only 34% of the value of its assets. With such a low level of debt, the company can easily take on more debt if needed. Foot Locker has ample working capital (with a current ratio of 3.3), meaning that the company has plenty of cash on hand and can easily pay its bills. Personally, I feel more comfortable investing in profitable companies with low total debt levels and generous amounts of working capital. When debt levels rise, so does the bankruptcy risk, which is something I like to avoid when investing with a long-term view. Foot Locker pays a dividend with a forward yield of 2.5% and a trailing yield of 2.3%. The company is paying out 30% of its profits as dividends. 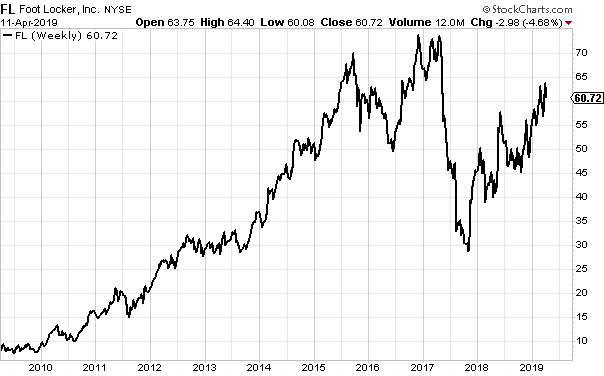 With a stock price of $61, Foot Locker's forward PE multiple is 10.7x. The company's trailing PE multiple is 13.0x, and its book value multiple is 2.7x. These multiples imply that Foot Locker is reasonably priced. Foot Locker has a strong history of growth, with its revenue increasing 5.6% per year over the last decade. The chart below visually shows Foot Locker's revenue and earnings trend over the last decade along with the next two years of consensus forecasts. As the above chart shows, Foot Locker has a history of consistently increasing its revenue. The company's earnings have also broadly following this growth trend, even though its earnings did drop considerably in the fiscal year ending 2018/01 before recovering. The forecasts show that the analysts are expecting Foot Locker's revenue and earnings growth trend to continue into the 2021/01 fiscal year. Foot Locker has plans to continue driving growth going forward. The company is increasing its focus on the children's market having invested $3 million in Super Heroic and another $12.5 million in Rockets of Awesome. Super Heroic is a lifestyle brand that markets footwear, clothing, and accessories. Their products are high performance and aimed specifically at children. Kids Foot Locker stores will be the brick-and-mortar retailer of Super Heroic products. Rockets of Awesome is an online brand that delivers children's apparel directly to its customers. Their clothing products will now also be available in Kids Foot Locker stores. I think that focusing on children is a smart investment move by Foot Locker. I relate this to McDonald's (NYSE:MCD) with their burgers. A sure fire way to get adults to eat McDonald's burgers is to appeal to them while they are still children. The product lineup that Super Heroic and Rockets of Awesome sell have been carefully designed to appeal to kids. Having these footwear and clothing items in Foot Locker's stores can only add to the desire for kids to enter and pressure their parents to make purchases on their behalf. Now for the McDonald's effect - these kids are now attracted to Foot Locker stores, and as they grow up, they will tend to keep going to Foot Locker stores. This will help with brand loyalty and secure Foot Locker's future revenue stream. Foot Locker is also looking to increase its presence in the women's luxury active wear market with a $15 million investment in Carbon38. The brand has an extremely loyal following in the fitness and fashion worlds. The Carbon38 fashion lineup will complement Foot Locker's own Six:02 women's athletic apparel brand. I personally think that the female market is more important to focus on than the male market for the simple reason that females are far more fashion-conscious than males. As a guy, you just need to look at female wardrobes and compare their wardrobe size to that of the typical male. To put it simply, females spend a lot more money on clothes than males do. This expenditure means it's more profitable to focus on the female market than it is to focus on the male market. While there's still money to be made with male apparel, I think it's smart business to focus more heavily on female apparel. Foot Locker is increasingly becoming an up-market active wear business by diversifying its product lineup to include the full spectrum of the fitness apparel market. I think management is on the right track to generate future growth by increasing its lineup of fitness clothing as this provides another revenue source to complement sales of their athletic shoes lineup. Our guidance of a double digit percentage increase in earnings per share also assumes a lower share count, based on the continued opportunistic execution of our share repurchase program. The company has reduced the number of shares outstanding by 7.8 million over the last year at a cost of $375 million. The repurchase has lowered the shares outstanding by 6.5% down to the current 112.3 million. The shares repurchase effectively increases the earnings per share by 6.5% giving earnings a boost. While a 6.5% boost may not seem like a lot, it can make a difference when it comes to the reporting season, and investors are comparing the earnings reported to what was expected. Foot Locker has a history of revenue and earnings growth. An appropriate method for valuing growth stocks is the PEG (PE divided by the earnings growth rate). The company's earnings growth from 2015/01 to 2019/01 is 6.0%, but management is expecting double-digit earnings growth. Earnings growth for 2021/01 is expected to be 10.4%, which gives a forward PEG of around 1.0 with a 2021/01 PE multiple of 10.7x. It's commonly accepted that a stock is fairly valued when its forward PEG is 1.0, which means that Foot Locker is fairly valued with a stock price of $61 based on its earnings growth potential. As an active investor, I personally like to determine some likely price targets. This gives me a feel for how high the stock price could go in the short term and how soon it could get there. Over the last decade, Foot Locker's stock price climbed to peak at around $74 late in 2016. From there, the stock pulled back marginally before trading back up in early 2017 to form a double top. The stock then sold down hard to bottom in 2017 as the company's earnings declined during the 2018/01 fiscal year. After bottoming, Foot Locker then traded back up, reclaiming most of its 2017 loss. In the short term, the stock will probably continue along its current path as long as the stock market continues its upwards trend. The stock advanced around $10 during 2018 and could well advance the same amount this year. Adding the $10 advance to the current stock price of around $60 could see a price target of $70 over the next year. Foot Locker has a history of earnings growth, and this growth is expected to continue. The stock is reasonably priced, with a forward PE of 10.7x, which will help provide some downwards protection. However, if earnings disappoint again, then I would expect another sell-off like that experienced in 2017. Over the longer term, Foot Locker has the potential to continue higher and will probably do so in line with its future earnings growth. I think that Foot Locker diversifying their product range will help produce future growth. Increasing their focus on the children's product lines will benefit the company in the years to come. While the stock did sell down during 2017 on the back of poor earnings for that year, this was only a temporary setback, and it did provide an opportunity for investors to buy at discounted prices. The stock has since rallied but is still reasonably priced with a forward PE of 10.7x. I think that Foot Locker would make a sound long-term investment, especially for value-focused investors. As a bonus, the stock pays a dividend with a reasonable 2.5% yield.